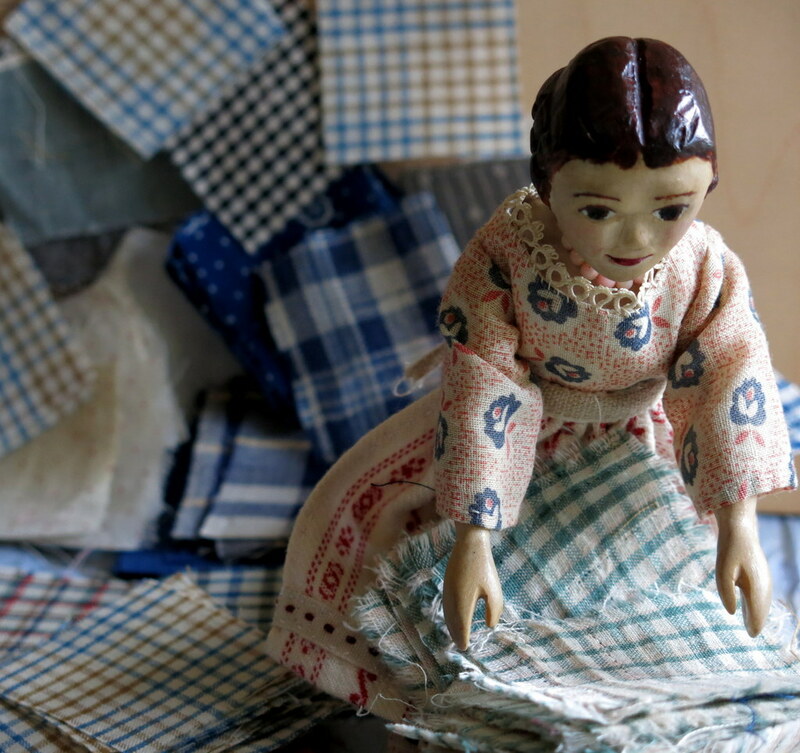 Constance knows what to do on a rainy summer Saturday – settle into textile projects! 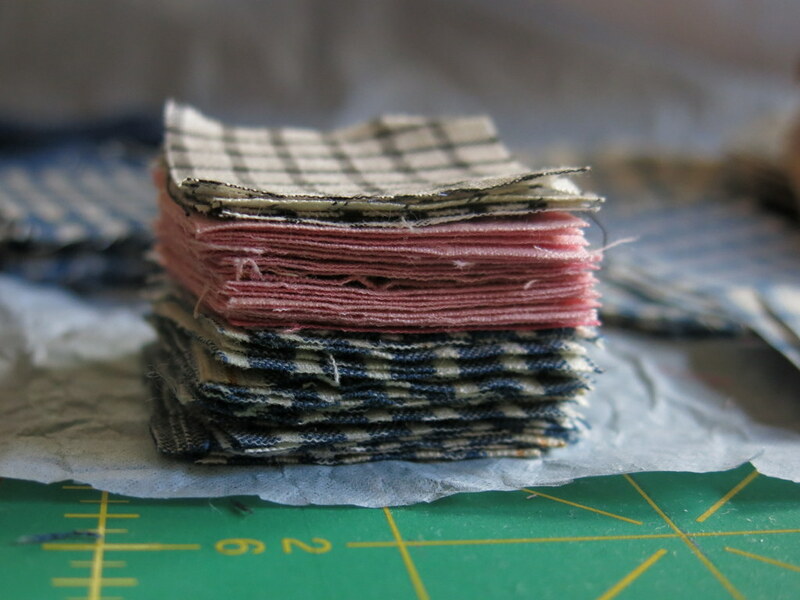 …and the squares all trimmed to the same size so that we can start planning some new quilts. Then Constance worked on the last piece of a rainbow garland on her new little Thumbelina peg loom. 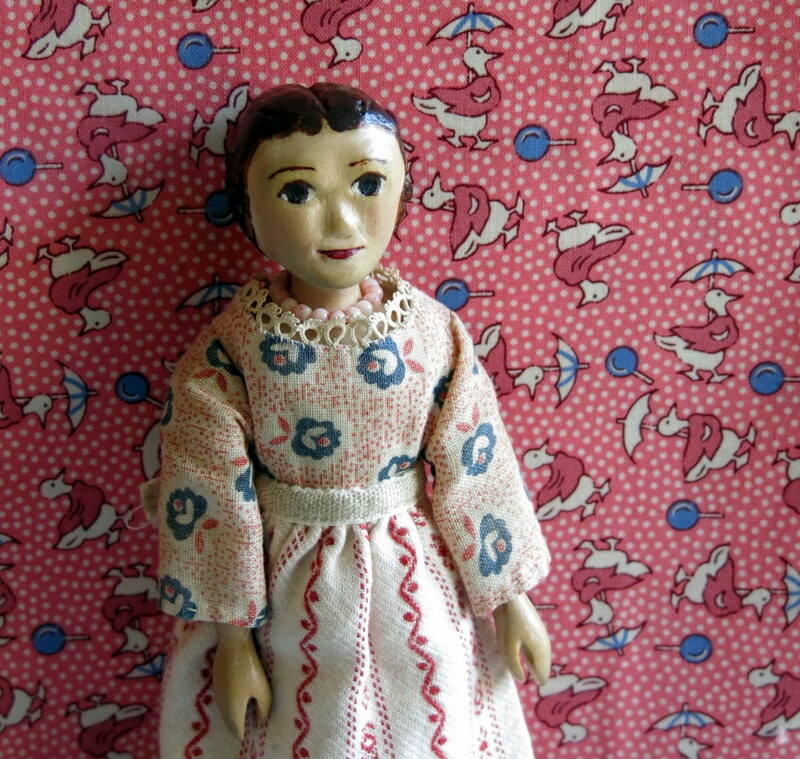 The loom was designed by Noreen Crone-Findlay and is a perfect size for Hitty! 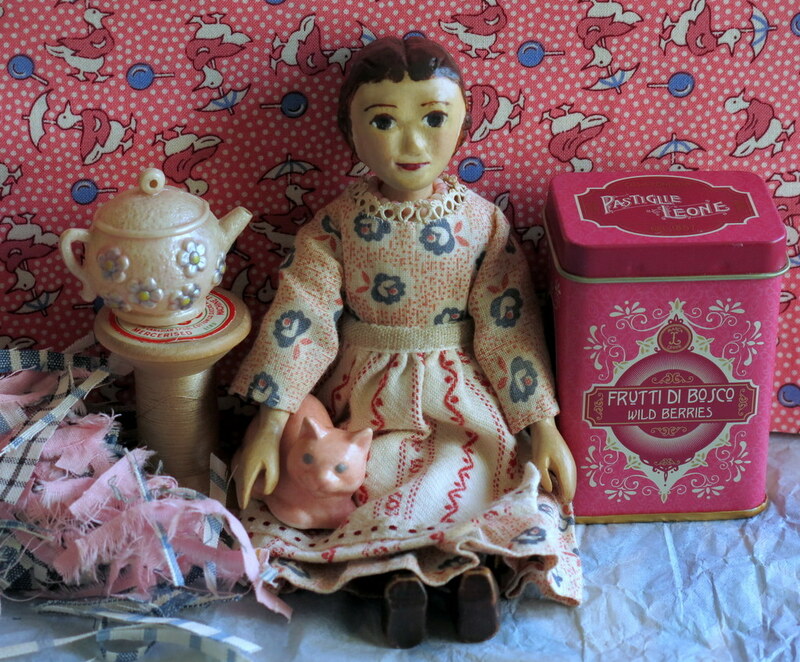 Constance thinks rainy Saturdays can be rather delightful if they include handwork, tea, sweets and purring lap cats…we’ll think about what to do with the pink ducky fabric another day! Thank you, to one Hitty friend for the fabrics, they will make a few sweet quilts! Noreen’s Website, with information about the Thumbelina Loom is here. Thumbelina is adorable! I had to get my cousin in Michigan to buy the wee loom for me, to avoid the commercial shipping-to-Canada costs. Despite it’s circuitous journey, I am loving it…and I love the idea of fog-shaded garlands, there certainly are lots of greys to choose from here today! Dear Constance, never idle, are you? I trust you and your dear caretaker will come up with works of art!!! I should go through my scrap pile and see if I could find something for you!!!! We find that having busy hands make trouble and gloom recede – and the bonus can be a delightful finished project! I especially love making Hitty-sized things! I am so happy to see Constance enjoying her Thumbelina loom! It is perfectly Hitty size, isn’t it? I am having so much fun designing with the Thumbelina and will be posting more video tutorials soon. 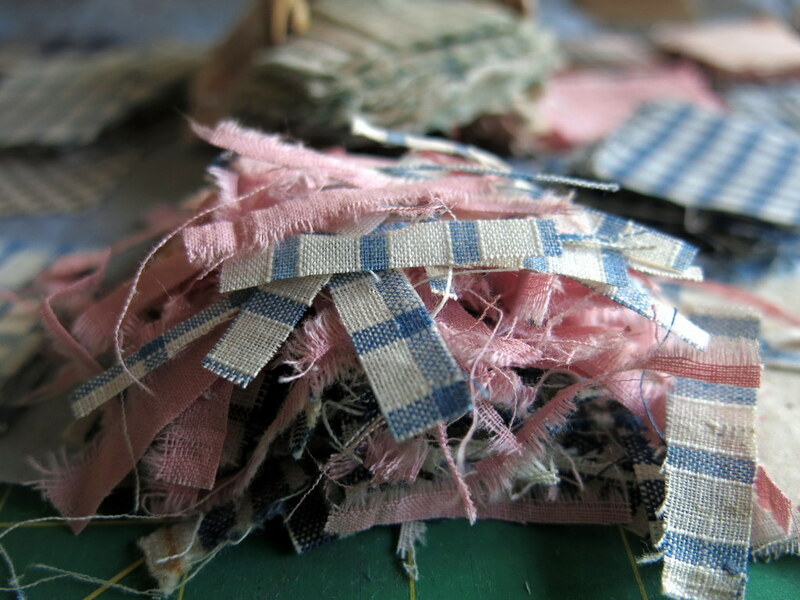 Happy weaving and happy quilting! And, of course, happy teatime, too! 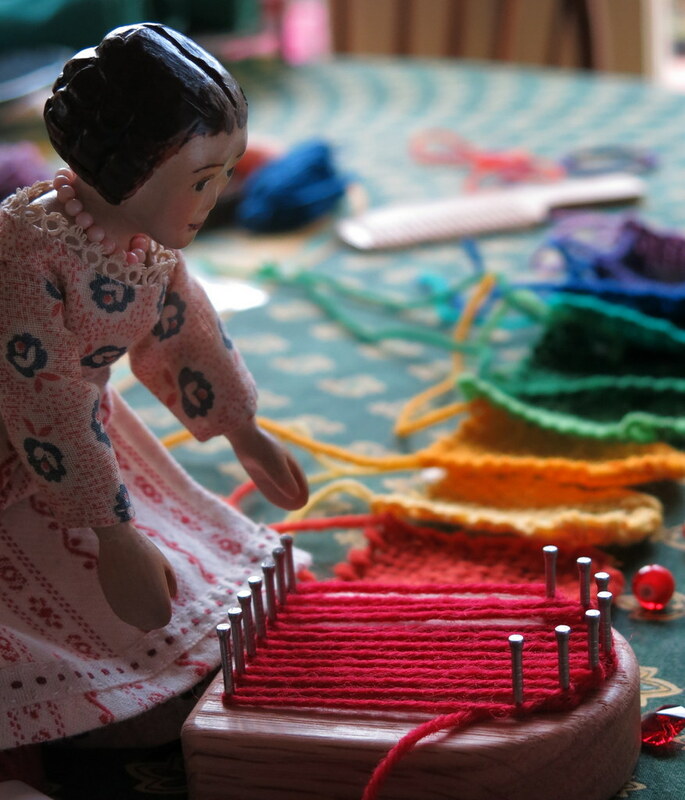 Constance loves her wee loom – thank you for inventing it! I am making a cord for the garland, using the lucet I got from you the last time I saw you here in Victoria! I will send you a picture! Constance knows how to deal with a rainy day…have an indoor rainbow. She didn’t even have to get wet to see it. Constance is always thinking outside the box or maybe in her case cupboard. Indoor Rainbow indeed! This garland is destined to decorate a festival booth, but we have plans to make more! Our original idea was to make a strawberry garland, but the rainbow popped into mind and elbowed its way to the front of the project list. I saw that loom featured a while back…interesting. And such a perfect size for Constance. We are also working on fabric projects here at the farm. Too hot and humid to be outside. Constance looks so cool, calm and collected. Love her little cat. It is a perfect Constance-sized loom! We are going to try tapestry on this loom too, but one thing at a time!